An evergreen screen of conifers. 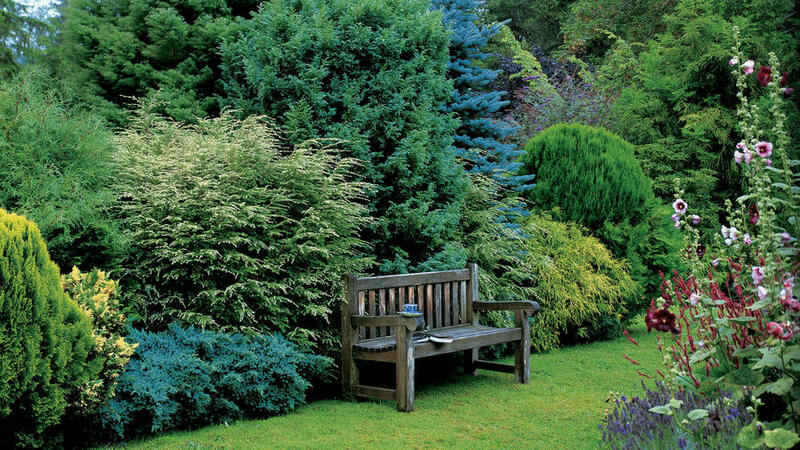 By carefully composing conifers that have contrasting foliage colors and forms, Ralph Hastings and his late partner, Holly Turner, created a magnificent evergreen screen behind a garden bench. Started 15 years ago, the planting is composed of dwarf conifers and other varieties that normally don’t grow very large. Over time, the plants grew together and stretched up toward the light, just as trees do in a forest. The excellent growing conditions at Hastings’s Froggwell Garden on Whidbey Island, Washington, prompted even the dwarf specimens to grow much taller than you’d expect. The screen is flanked by a pair of Oriental arborvitae. The other plants are identified in the diagram and list at right. If you’d like to create a similar screen, fall is an ideal time to plant conifers from containers. After planting, soak the rootballs and water as needed to keep them damp until fall rains take over. When new growth begins next spring, feed the plants with a controlled-release fertilizer.